The book gives a living view on the life of a Tibetan monk and training up to the Geshe degree. The merit for the autobiography goes to the expert on Tibetan Buddhism, B. Alan Wallace. He documented the story of Geshe Tadrin Rabten (1920-1986): how he became a geshe, above Dharamsala in the mountains in 1972 (remark: geshe is the highest learned degree in a Tibetan monastery university). 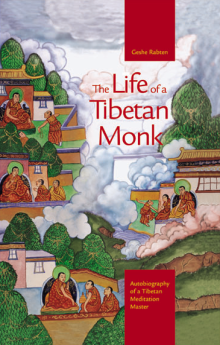 The book follows the natural career: The life a farmhouse boy in Kham region, studies at Sera monastery, meeting Gurus, common monastery life and training as an elder monk, connections to the west and so on. Among the most interesting the book gives is the description how the monks in Sera study from one class to another. They have to pass 14 classes (sometimes 15) including debates to advance to the geshe degree. I have not found a corresponding system elsewhere, so I greet this with joy. Likewise, the topic list for geshe studies and the descriptions of the empowerment ceremony concretize this route to the aforementioned degree. To make the book alive numerous illustrations and photos has been used, most of them not used before, as the editors of the book say. The illustrations are lyrical pictures on the Tibetan way of life and happenings; the photos record precisely people, buildings, landscapes, cultural documents and things. The glossary in Sanskrit and Tibetan and the explanation of these words in Finnish is worth a praise. The story of the Venerable Master advances in a question-answer way and it works keeping on a stirring excitement: what is coming next? The autobiography is completed with an extensive epilogue (its number of pages is about the third of the book) written by Gonsar Rinpoche. He was Geshe Rabten’s closest student and the spiritual son, who lived with his Master for 33 years, since he was five years old. As we are among the Tibetan Masters the story continues from one life to another. His Holiness the Dalai Lama confirmed and sealed the election of Kalsang Tsering to be the correct choice of the rebirth of Geshe Rabten. His name became Tenzin Ragbye. With pleasure I wish that this autobiography of the Tibetan meditation master will be worn in the hands of western readers. I started my own reading journey to Tibet on one Saturday morning in the early part of the summer and it was already in the evening when I turned the last page. I had wandered a lifelong, slow and determined journey of dharma practice. Geshe Rabten (1920-1986) was born in Eastern Tibet where the landscapes change colours when seasons change and the grass is stiff as rock. The young man left behind his family and trekked to Lhasa guided by his inner call to train his mind according to the teachings of the Buddha. The way of spiritual development finally leads him to teach the Europeans by Dalai Lama’s request. For the reader clarifies a picture of continuous connection between the student and the spiritual teacher. Trekking over mountains and passes to the Master and the return to monastery in Lhasa after scolding makes the Geshe humane in the eyes of a lay person. The beauty and hardness of Tibet is described in a realistic and fascinating way. “When the wind was blowing the apricots were falling to the ground with a soft thump”, Geshe tells, when he and his fellow traveller stop for a break to read Holy Scriptures. The book presents journey with adventure feeling into the life of a venerable spiritual leader. I recommend to begin the reading with the epilogue, where Geshe’s autobiography is completed by his student Gonsar Rinpoche. Geshe tells about his life stage by stage. Especially remembering the student days is interesting to read with debates all the night. The book gives a picture of a very intelligent, sharp minded person, whose teachings even in the difficult topics is understood by the students’ minds. Geshe is described as a warm and compassionate teacher with a good sense of humour, who taught unselfishly and without fanaticism. Geshe Rabten’s story is worth to become acquainted with. A spiritual Master with a tender world loving lap, where also the mice slept. The book is easy to read and includes a glossary for the lay person. The not before published photos of the book completes the content, as also the other illustrations. The autobiography makes the reader think how to train the own mind.